Craig Thompson came to Huckins in 2003. 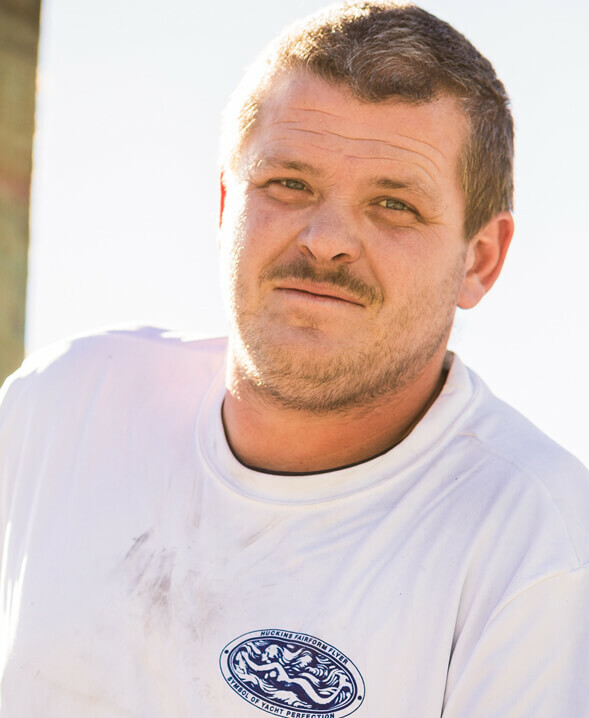 Prior to assuming the role of foreman of the dock crew, Craig worked with the hauling and launching team, where he learned the ins and outs of preparing yachts for service work. As foreman of the dock crew, Craig is now responsible for properly blocking and securing every yacht in the yard. He makes certain that all electrical cords are plugged in and functioning. He is also responsible for the intricate detailing, daily and weekly washings and maintaining the general cleanliness of the yacht while it is in the yard. Craig is a skilled lift operator and he and his crew are constantly in demand, since most service projects cannot begin until the yacht is hauled, bottom-washed and blocked. Furthermore, only after Craig and his crew launch a serviced yacht, can the owner happily cruise away. PropSpeed is a great product to prevent marine growth on running gear. Properly prepped and applied, PropSpeed increases speed, while reducing fuel consumption. We caution anyone diving on the boat to only brush the running gear. Scraping it will damage the coating.